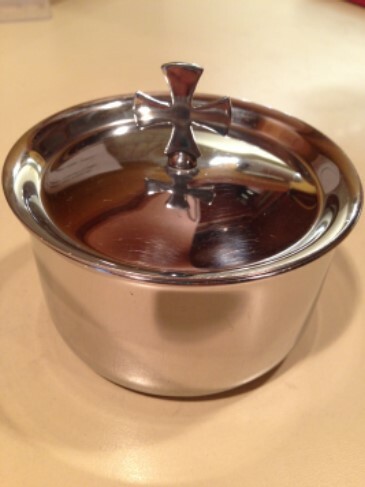 If you have Celiac disease, or other allergies to wheat, you may now receive the Body of Christ (low-gluten Host, containing 0.01% gluten) in the regular communion line, from the communion minister with the silver ciborium (see image right) in front of the altar. To read more about our hosts from the supplier, please read the Benedictine Sisters’ article on low-gluten hosts. You can also read more information on this matter from the USCCB Committee on Divine Worship here. Receiving the Precious Blood of Christ in the form of Mustum: All who were previously unable to partake of the Precious Blood at Communion – those who for medical reasons cannot consume alcohol in any amount – are now invited to receive from the SILVER CUP (see image below) in the middle of the church. 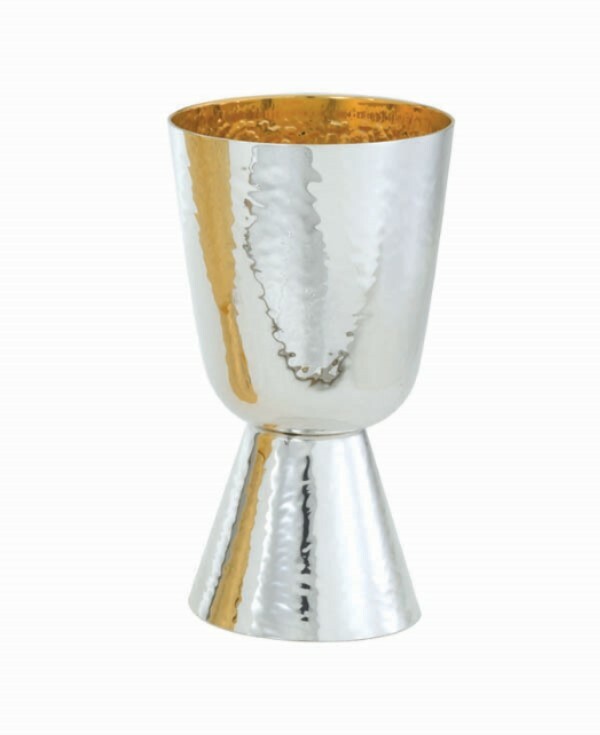 This is the small silver communion cup (not Father’s chalice). Mustum is the Latin word for non-alcoholic sacramental grape juice. We purchase it through one of the two national distributors approved by the USCCB and the Priests’ Council on Alcoholism. Low gluten hosts contain no more than 0.01% gluten. Mustum does contain trace amounts of alcohol (0.01% to 0.049%). These elements are required by church law for sacramental validity.